Do your need an experienced attorney to handle your breach of contract lawsuit? Our Chicago breach of contract lawyers regularly litigate in both state and federal court in and around Cook County, DuPage County, Kane County and Will County. Our business litigation attorneys represent both plaintiffs and defendants in various breach of contract cases. Can I File a Breach of Contract Lawsuit? A breach of contract lawsuit could arise when: (1) the other party to the business contract has failed to perform or make payment as promised, (2) the other party has made it impossible to perform, (3) the other party has made it known he or she does not intend to perform as promised. Failure to perform under a contract means failure to do what the contract requires. For example, failure to make payments pursuant to an agreement and failure to provide services or goods pursuant to an agreement could constitute a breach of contract. Failure to produce expected results can also be grounds for a breach of contract lawsuit. Although contracts should be in writing, it is also possible to enforce oral agreements. The following types agreements must be in writing (among others): (1) contracts for sale of real property, (2) contracts that take longer than one year to complete, (3) property leases for more than one year, (4) contracts for the sale of goods above a certain dollar amount, (5) contracts where one party agrees to pay the debt of another party. How Long Do I Have to File a Breach of Contract Lawsuit? The time that you have to file your breach of contract lawsuit is called the statute of limitations. 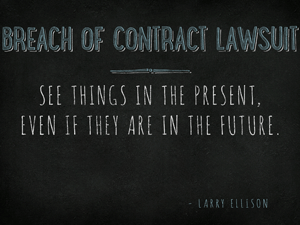 Typically, in Illinois, the limitations period for written contracts ins ten (10) years. For oral contracts, the statute of limitations is five (5) years. For contracts for the sale of goods, the limitations period is four (4) years. The time period typically accrues at the time of the breach. Of course, any breach of contract lawsuit might also involve additional claims with different applicable limitations periods. Be sure to contact our Chicago litigation attorneys to determine what, if any, claims you have and what time limitations apply. Where Should I File My Breach of Contract Lawsuit? Where a breach of contract lawsuit can be field is different depending on each individual contract and the specific facts surrounding that contract. For example, some contracts have a specific venue provision, requiring any lawsuit to be filed in a specific state or county (for example, Illinois, and/or Cook County or DuPage County). Other business contracts lack such provisions, in which case other items will be considered, such as where the breach of contract occurred, where the parties are located and/or where the contract was negotiated and/or executed, among other considerations. Our Chicago corporate litigation attorneys will assist you in determining the proper venue for your breach of contract lawsuit. The first remedy on every client’s mind is damages – “What are my damages?” In other words, what breach of contract remedies can I pursue? Alleging and proving damages can be tricky. Typically, the first type of monetary damages considered is compensatory damages. Compensatory damages compensate a party for financial losses as a result of a breach of contract. Other damages for breach of contract include rescission, reformation, specific performance and restitution. Rescission terminates the contract and both parties’ obligations under the contract. For reformation, the substance of the contract will change to “fix” the contract so as to correct any inequities for either party. For specific performance, the court will force the breaching party to perform per the contract or deliver the promised services or goods per the contract. For restitution, the non-breaching party (usually the plaintiff) is restored to its position prior to defendant’s breach of contract—for example, money or property is returned. If you are a defendant in a breach of contract lawsuit or have received a threat or notice of a breach of contract lawsuit, we recommend you take action to defend yourself and/or your business. The risk of not responding could end up being more expensive than responding and settling and/or defending the lawsuit. It is important to take action to defend your rights prior to an adverse (default) judgment is entered against you or your business. Our Chicago business lawyers are experienced in prosecuting and defending breach of contract lawsuits. Defending a breach of contract lawsuit requires the gathering of necessary facts and information to determine what, if any, defenses and counterclaims can be made. Defenses in a breach of contract lawsuit include, among others: (1) contract is vague or ambiguous, (2) mutual mistake, (3) misrepresentation / inducement, (4) duress, (5) estoppel, (6) contract is illegal, (7) unconscionability, (8) impossibility, (9) frustration of purpose, (10) statute of frauds (contract should have been in writing), (11) statute of limitations (not timely filed). In addition to any defenses to the breach of contract lawsuit, you or your business might also have counterclaims against the plaintiff. One such counterclaim could be breach of contract. Whether you are a plaintiff or a defendant in a breach of contract case, settling the case could be the best way to achieve a timely, efficient and cost-effective result. Litigation can be time consuming, costly and risky. Although settlement is not always an option, it has proven to be an extremely good way to reduce risk for both plaintiffs and defendants. Oftentimes cases do not settle until the eve of trial and sometimes they settle before a lawsuit is filed. For further information on this topic, see our page covering negotiating settlements. Our Chicago business litigation attorneys can assist you with the prosecution or defense of your breach of contract lawsuit. Our law firm regularly handles breach of contract cases in state and federal courts throughout Illinois, including Cook, DuPage, Kane and Will Counties. To schedule a free consultation with one of our attorneys, please complete the contact form to your right or call 312-789-5676.